Images from the lunar calendar mark a special occasion in this personalized print. Stop the cosmic clock to remember the moment just as it was the first time you met, when he proposed, or the night you drove your newest bundle home from the hospital. Inspired by family camping trips spent staring at the night sky, Amy Evenson uses software to determine the phase of the moon from your date of choice. 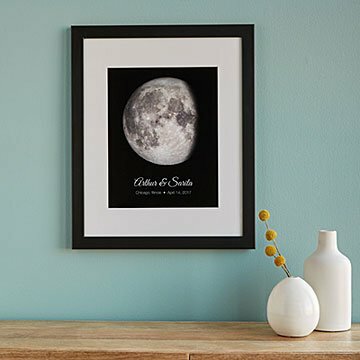 A beautiful reminder of life's moonlit moments, the lunar image is further personalized with your names and the date of the celestial scene. Designed in Wasau, Wisconsin. Printed in the US. Avoid hanging finished print in direct sunlight to preserve color range. I had a bit of trouble with the online ordering but only because I live in Canada and couldn't use my US credit card. I managed to circumvent the problem with the online help of an Uncommon goods associate. I still gave the entire experience a rating of 5 because everything else worked perfectly and I am very pleased. Thank you. They loved the gift. Falls right into their running, camping adventures under the light of the moon. Lunar Phase of Love Awesome Artist! We hung it up right away on our family photo wall. It's a great way to celebrate our start together. Needed ideas for couple that has everything. Shipping as a gift.